^ Lathbury, Thomas (1858). A History of the Book of Common Prayer and Other Books of Authority. Oxford: John Henry and James Parker. p. 430. https://books.google.com/?id=15E5AAAAMAAJ. 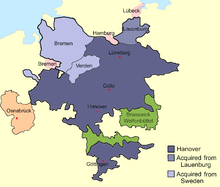 "George I. remained a Lutheran as long as he lived, and had his German chaplain; but he conformed on some occasions with the Church of England. 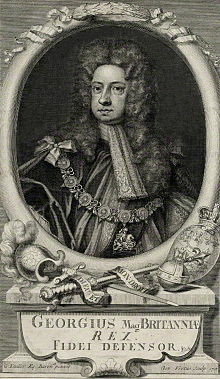 George II. was in the same position. Though Lutherans, they exercised acts of supremacy in the Church of England; and the common opinion was, that there was no opposition between the views of the two Churches"
^ Huberty, Michel; Giraud, Alain; Magdelaine, F. et B. (1981) (French). L'Allemagne Dynastique, Tome III. Le Perreux: Alain Giraud. p. 85. ISBN 2-901138-03-9. ^ a b c Weir, Alison (1996). Britain's Royal Families: The Complete Genealogy, Revised edition. Random House. pp. 272–276. ISBN 0-7126-7448-9. ^ Hatton, Ragnhild (1978). 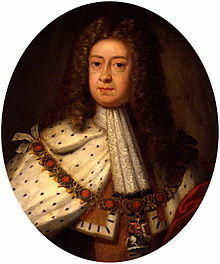 George I: Elector and King. London: Thames and Hudson. pp. 26–28. ISBN 0-500-25060-X. ^ Schama, Simon (2001). A History of Britain – The British Wars 1603–1776. BBC Worldwide Ltd. p. 336. ISBN 0-563-53747-7. ^ Whatley, Christopher A. (2001). Bought and Sold for English Gold? : Explaining the Union of 1707, Second edition. East Linton, Scotland: Tuckwell Press. ISBN 1-86232-140-X. ^ Riley, P.W.J. (1978). The Union of England and Scotland: A Study in Anglo-Scottish Politics of the Eighteenth Century. Totowa, New Jersey: Rowman and Littlefield. ISBN 0-8476-6155-5. ^ Lease, Owen C. (1950). “The Septennial Act of 1716”. The Journal of Modern History 22: 42–47. doi:10.1086/237317. ^ Dickinson, Harry T. (1973). Walpole and the Whig Supremacy. London, UK: The English Universities Press. p. 52. ISBN 0-340-11515-7. ^ Arkell, R. L. (1937). “George I's Letters to His Daughter”. The English Historical Review 52: 492–499. doi:10.1093/ehr/LII.CCVII.492. ^ Lenman, Bruce (1980). The Jacobite Risings in Britain 1689–1746. London: Eyre Methuen. pp. 192–193. ISBN 0-413-39650-9. ^ Szechi, Daniel (1994). The Jacobites: Britain and Europe 1688–1788. Manchester and New York: Manchester University Press. pp. 109–110. ISBN 0-7190-3774-3. ^ Black, Jeremy (2001). 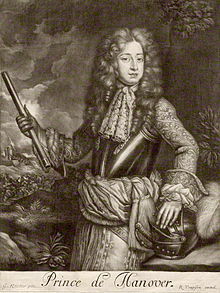 Walpole in Power. Stroud, Gloucestershire, UK: Sutton Publishing. p. 20. ISBN 0-7509-2523-X. ^ Ashley, Mike (1998). The Mammoth Book of British Kings and Queens. London, UK: Robinson. p. 672. ISBN 1-84119-096-9. ^ Thackeray, W. M. (1880) . The Four Georges: Sketches of Manners, Morals, Court and Town Life. London: Smith, Elder. pp. 52–53. https://archive.org/stream/fourgeorge00thac#page/52/mode/2up. ^ Smith, Hannah (2006). Georgian Monarchy: Politics and Culture, 1714–1760. Cambridge, UK: Cambridge University Press. pp. 3–9. ISBN 0-521-82876-7. ^ Plumb, J. H. (1967). 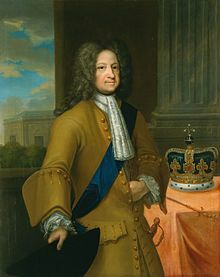 “George I”. Collier's Encyclopedia. 10. p. 703. ^ Louda, Jiří; Maclagan, Michael (1999). 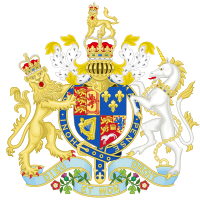 Lines of Succession: Heraldry of the Royal Families of Europe. London: Little, Brown. p. 29. ISBN 1-85605-469-1. ^ Pinches, John Harvey; Pinches, Rosemary (1974). The Royal Heraldry of England. Heraldry Today. Slough, Buckinghamshire: Hollen Street Press. p. 203. ISBN 0-900455-25-X.